The 2016 Inaugural DRR Ultimate Series presented by American Race Cars saw over 380 individual entrants compete for over $750,000 in total purse and points fund prizes, making it one of the most talked about Sportsman Racing Series in the country last year. We are proud to announce that American Race Cars returns as “Title Right” sponsor and will once again be building the Championship Dragster which will be painted by Todd’s Extreme paint. Like in 2016 Oakley Motorsports also returns as the $50,000 Main Event Sponsor and will again present the 1000 HP Big Block Chevrolet to the series Runner Up. BRODIX and YUKON Gear & Axle also return along with a multitude of other companies presenting over $100,000 in awarded Points Fund prizes. We are also proud to announce $695 as the New Low Price Weekend Entry, no pre-entry required, pay at the gate or online if you would like. The payout structure has been slightly modified but we feel this new lower price point will allow racers to include the 2017 DRR Series into their racing schedule. Three Big Weekends of 100% Guaranteed Payouts with $20k-$50k-$20k to Win and No Minimum Car Count! Also new for 2017 and highly requested from last year will be an adjustment to the Double Entry Rule to allow a single driver to drive the same car twice if they like, allowing racers who don’t have the availability of 2 race cars to run 2 points numbers at each event. The other significant modification to the series is that at no point will we go to a ladder in 2017. With so many racers traveling together and driving 2 cars in this day and age of Big Bucks Racing, we only felt it appropriate to remove the “un-lucky factor” in the later rounds of having to race yourself on the ladder. Our 2017 dates were released as early as possible for other promoters to recognize, but sometimes scheduling conflicts present themselves. 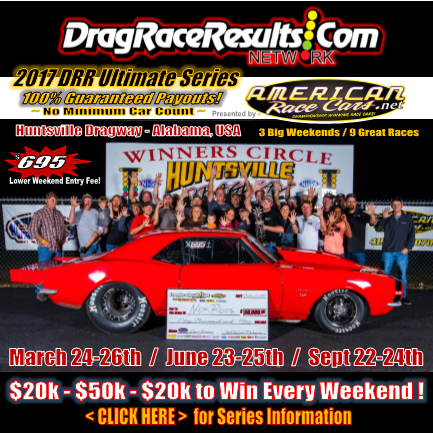 Centrally located Huntsville Dragway has become a “Hot Bed” for Big Bucks Bracket Racing and will continue to be the home of the DRR Ultimate Series. Nicole, Megan and I along with TT and Angie Jones the owners of Huntsville Dragway realize how important it is to work with other Promoters and Race Tracks for the “best interest” of the racers. 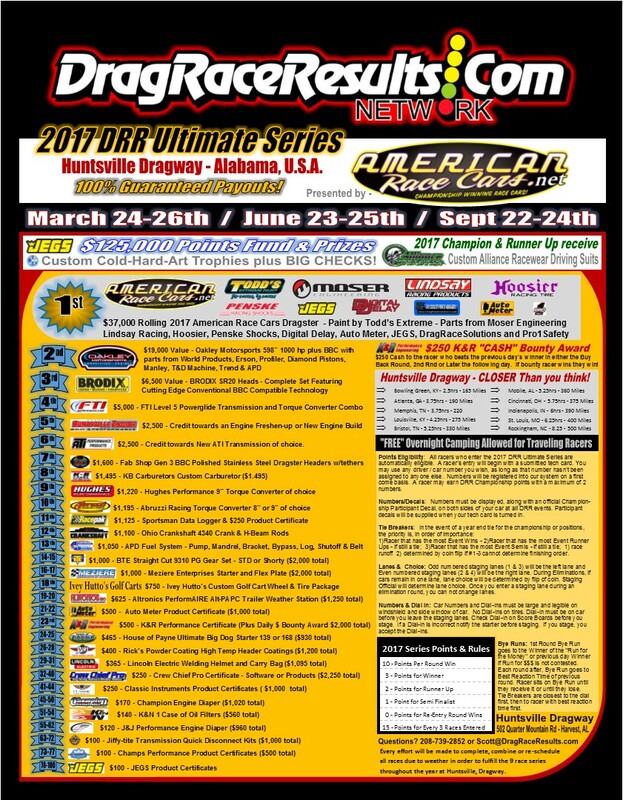 With an “onslaught” of new Big Bucks Bracket Races available to racers in 2017, minor schedule changes have been required for “fairness” to the racers in order to not stack races on top of one another and to leave adequate space between races in respect to the racers budgets and time away from work and family. 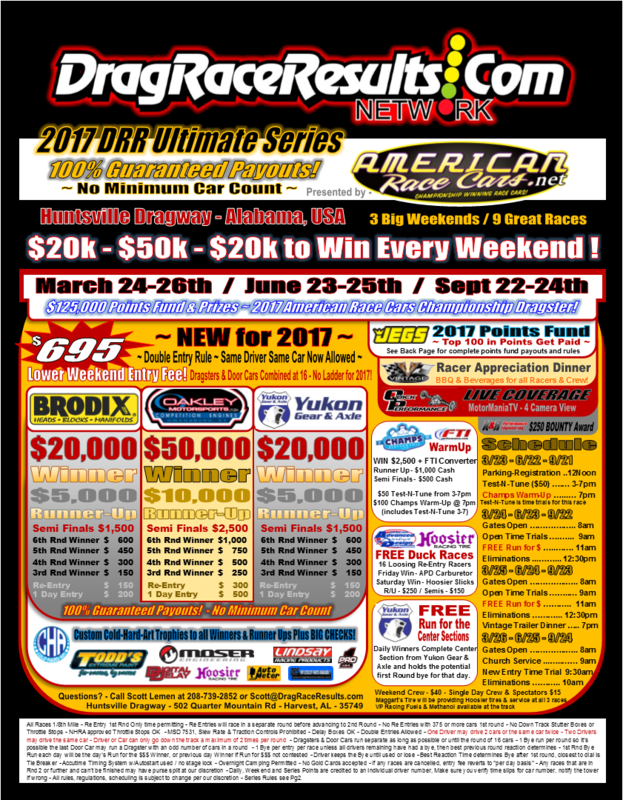 The official dates of the 2017 DRR Ultimate Series will be March 24-26th, June 23-25th and September 22-24th which supersedes any previously released dates, with a “New for 2017” FTI Warm Up Gambler Race / Test-N-Tune the Thursday prior to each event presented by Champs Performance.